Not unlike Japanese culture, the Chinese ideal for physical exercises is hard work. The Chinese word for that is “gong” (功). It is used in “Qigong” – working with the Qi, i.e. cultivating life energy – as well as in “gongfu” – referring to skills which are developed in a long work process. Gongfu applies to both martial skills and skills of a craftsman or an artist, in fact to all activities which need much effort to be mastered. If you do not practise on one single day, you will know it. If you do not practise for two days in a row, your teacher will see it. If you do not practise for a whole week, the whole world will see it. training hours: at least 8 hours a day (early morning meditation at the top of the mountain and training hours with students not included, no weekend breaks, no holidays). training programmes: ranging from decade-long working on one single brushstroke or sharpening a men-height piece of steel into a needle (No, not trying and contemplating the philosophical symbolism, but actually arriving at needle stage!) to the more unspectacular, as e.g. multiple repetitions of various forms of the master’s style. stunning results: Some of the old masters could fly, couldn’t they? Or at least walk the walls. Or scare the tiger away. And when Yang Luchan was practising, the roof tiles of the surrounding houses were moving, so advanced was the development of his Qi. And not only that: our old masters always had a wise word to spread on top of that. Alas, these stories are not relevant to the daily life of the many. They might even discourage people who are struggling already to find a place for themselves between the constrictions of their working life, their family life, their social life. 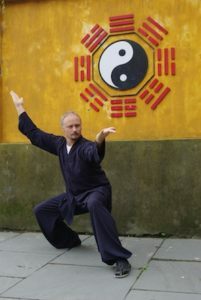 taiji-forum.com > Tai Chi > Basics of Tai Chi > How long and how often should I practise Taijiquan or Qigong? How long and how often should I practise?